HARTFORD, CT – After opening two bakeries in Bridgeport that closed in the bad economy, Julio Anora and his wife took a trip to Los Angeles — and that’s where the light bulb went off. They saw a crowd of people around a solar-paneled gourmet food truck (it was L.A., after all). “We said, let’s try it,” Anora says. 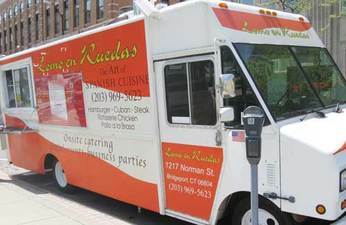 Today, Anora and his wife Magdala Fernandez’s big orange-and-white food truck “Lomo en Ruedas” draws a steady stream of customers on Broad Street outside the Fairfield County Courthouse in Bridgeport. Food trucks are hot — for customers and purveyors. Foodies love to discover eat-on-the-street, inexpensive made-to-order food. And independent-minded cooks find it an appealing alternative to owning a stationary restaurant, which carries high overhead costs. 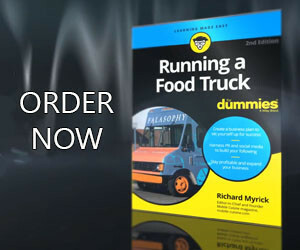 That doesn’t mean that running a food truck business is easy. The space is cramped. “When it gets hot it gets really hot, and when it gets cold it gets really cold,” says Alexandra Terron, co-owner of El Charrito, a popular food truck in Stamford. The trucks must have “ventilation, a three-bay sink, a separate hand-washing station, screens,” says Sue Zaborowski, Danbury’s social service manager, who was the public health inspector for 30 years. “They need a vending license, a surety bond, and fingerprinting for a background check. We don’t want pedophiles selling ice cream to kids.” Trucks that use propane for cooking need to be inspected by the fire department. A permit from the police department is required before a truck can set up in a location. And trucks are expensive. To cut down on the cost, Anora bought a used potato chip delivery van and spent six months outfitting it with a stove, running water, a refrigerator, freezer, fryolator, smoothie machine, chicken rotisserie, coffeemaker, electrical circuits and a generator. “There were a few glitches,” he says. “The first generator was too small. But now we bought the monster generator you see on the front of the truck.” He says it would have cost him $80,000 to buy and outfit the truck ready-made. A year and a half ago, Janet Marzan bought Snappy Dawg, a food cart that operates on the sidewalk outside the Bridgeport courthouse on Main Street. “Thank God I have a background in fixing things,” she says. Along with having managed Burger Kings and McDonald’s, she was an electrical mechanic who repaired exercise equipment in gyms.